Polar bear cub at Ranua Wildlife Park finally out! On Wednesday 16.3.2017 at noon the new polar bear cub at Ranua Wildlife Park got its first chance to experience the outside world as the hatch of the polar bear den was opened for the first time. The cub, naturally, was totally amazed of its first contact with the outside world having spent close to four months inside the den in the safety and nurturing of its dam – even though, this very same morning, the animal attendant gave it some snow into the den to have the first sensing of something new to come. 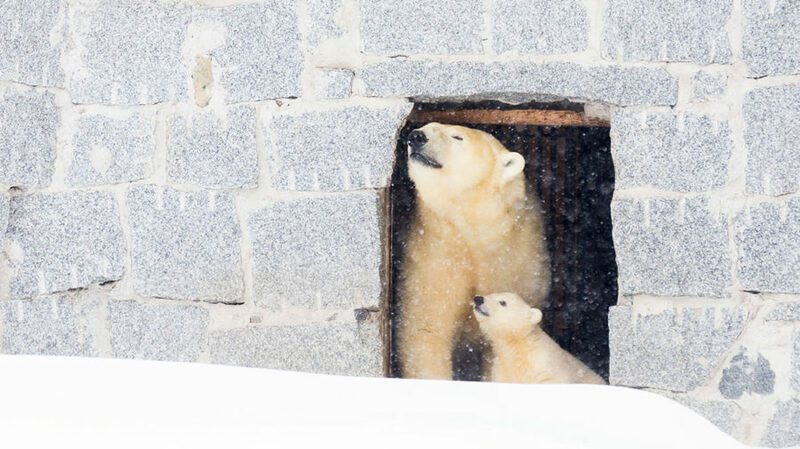 The polar bear family has its choice to either spend time out in the fencing, or so willing, in the safety of its den, during the coming weeks. As the cub grows, the dam will allow its offspring to spend ever more time outside and go ever further away from the hatch of the den. Read our previous article about the Polar bear cub.